"The purpose of the court is not to please anybody, why do states feel threatened. Now that Burundi has left the ICC, we are going to reassure the states. This concerns us a lot," he said. Mahr they will continue to make their case valid. "And this is where we should be more clear because we are not political and it is up to the court to decide whether a case can be investigated or not," he said. Uganda has been threatening to quit the Rome statute, which establishes the ICC, with President Yoweri Museveni, accusing the court of bias towards prosecuting African states. US President, Donald Trump recently criticised ICC, saying it has no jurisdiction, legitimacy or authority. Mahr also said they are facing funding challenges and asked other states to come in to support the court. The ICC, established through the Rome statute is an international tribunal and intergovernmental organisation that sits in The Hague in the Netherlands. It has the jurisdiction to prosecute individuals for war crimes and crimes against humanity. It is currently trying Dominic Ongwen, the former commander of Sania Brigade under the rebel Lord's Resistance Army (LRA) for atrocities committed in Odek, Abok, Pajule and Lukodi. It is also trying former Ivory Coast president, Laurento Gbagbo for crimes against humanity. The court withdrew charges against Kenya's President Uhuru Kenyatta and his deputy, William Ruto after they were accused of crimes resulting from Kenya's election violence in 2007-2008. The court is also considering looking at cases of American soldiers who committed war crimes in Afghanistan. Kitegeere nti obulwadde tebukwata muntu omu bwati. Buyinza nokufuuka kawumpuli abaana bangi nebagwawo munsi yaffe! Omwaana ono singa abasawo be Uganda balina obusobozi singa bogeragana nabasawo be Buyindi ku video okulaba kiki ekisanide okukolebwa. Omwaana bwaba tatambude kugenda Buyindi kijja kukendeza kusente ezetagibwa okumujjanjaba. Amagezi go bukugu bwokujjanjaba abaana ne ddagala eryetagibwa lifunika ku sente entono olwa medical research eriwo munsi zonna. Sebo Mr Lusiba ffenna tuli bazadde era tumanyi kyoyitamu. Nga bwoli owamawulire genda ku internet otekemu erinya lyobulwadde. Aba Children Medical Centre bakuyambe. Governmenti nensi nyingi zibawa sente okukola kunsonga nga zino kulwekitongole kya World Health Organization. Who in the country of Kenya will hang this African prison beauty queen Ruth Kamande? News on the sentencing of one of the women who was described as a 'beauty' at Lang'ata prison after winning that title has spread across the country. Ruth Kamande commonly known as Miss Lang'ata was handed the maximum death penalty for stabbing her boyfriend 25 times in 2015. The man who was Kenya’s last and longest serving hangman at Kamiti Maximum Security Prison died in 2009. No executions have been carried out in Kenya since 1987 when Kenya Air Force senior private official Hezekiah Ochuka and Pancras Oteyo Okumu were hanged for treason. More on this: No hanging since 1987: Is death penalty still relevant? Following the signing at State House, Nairobi, some 2,747 Death Row convicts will now serve life imprisonment — 2,655 males and 92 females. Justice Njoki Ndung'u said the section "is out of sync and cannot stand as it is inconsistent with the constitution". Last month, the AG's office said that the task force will give its report by December this year. Kenyans on social media have weighed in the matter as they caution those who kill because a relationship has failed. "Ruth Kamande sentenced to death for stabbing her boyfriend to death in 2015. No matter how sore your relationship gets you have no right to murder anyone," User Muhy Deen said. User Konie said, "It is unfortunate that girl child just killed boy child in cold blood,'Ruth Kamande',you have to pay for the assault." "Judge Jessie Lesiit should have just handed Ruth Kamande to team mafisi as punishment," user Jimmy Jazz said. Another user Ivan Wanjiku said "Ruth Kamande is too beautiful to rot in jail." User ‏Mugiira Job said there was nothing unique with sentencing Kamande. "Judges hand death sentence to people daily. Could #KOT be majoring on Miss Lang'ata title as the key thing? A killer is a killer," he said. Daniel Kiragu said "Ruth Kamande sent to the Gallows...maslay queens mtajua hamjui. A win for the boy child." "Anger can lead someone to a place they never expected.... That's why i always advice my fellow ladies never kill,abuse or fight over a man," user Martha Wa Njung'e said. She added "If you are angered with him because of anything be in charge of that anger..walk away. It Is sad such a young and beautiful lady wasted because of Anger and Jealousy." User Domie Njerih said It was unfortunate that the beauty queen had been sentenced to death due to 'unfortunate event' that transpired. "My advice to young couples always leave an abusive relationship before its to late," she said. Late Bob Marley ever warns the young at heart and sings this advice. Never love a beautiful woman. You can end up killing your brother. She will put you and herself in trouble! But then beauty is for the beholder? Out of the welter of medieval weights and measures emerged several national systems, reformed and reorganized many times over the centuries; ultimately nearly all of these systems were replaced by the metric system. In Britain and in its American colonies, however, the altered medieval system survived. 1The U.S. uses avoirdupois units as the common system of measuring weight. By the time of Magna Carta (1215), abuses of weights and measures were so common that a clause was inserted in the charter to correct those on grain and wine, demanding a common measure for both. A few years later a royal ordinance entitled “Assize of Weights and Measures” defined a broad list of units and standards so successfully that it remained in force for several centuries thereafter. A standard yard, “the Iron Yard of our Lord the King,” was prescribed for the realm, divided into the traditional 3 feet, each of 12 inches, “neither more nor less.” The perch (later the rod) was defined as 5.5 yards or 16.5 feet. The inch was subdivided for instructional purposes into 3 barley corns. The furlong (a “furrow long”) was eventually standardized as an eighth of a mile and the acre (from an Anglo-Saxon word) as an area 4 rods wide by 40 long. There were many other units standardized during this period. The influence of the Champagne fairs may be seen in the separate English pounds for troy weight, perhaps from Troyes, one of the principal fair cities, and avoirdupois weight, the term used at the fairs for goods that had to be weighed—sugar, salt, alum, dyes, grain. The troy pound, for weighing gold and silver bullion, and the apothecaries’ weight for drugs contained only 12 troy ounces. A multiple of the English pound was the stone, which added a fresh element of confusion to the system by equaling neither 12 nor 16 but 14 pounds, among dozens of other pounds, depending on the products involved. The sacks of raw wool, which were medieval England’s principal export, weighed 26 stone, or 364 pounds; large standards, weighing 91 pounds, or one-fourth of a sack, were employed in wool weighing. The sets of standards, which were sent out from London to the provincial towns, were usually of bronze or brass. Discrepancies crept into the system, and in 1496, following a Parliamentary inquiry, new standards were made and sent out, a procedure repeated in 1588 under Queen Elizabeth I. Reissues of standards were common throughout the Middle Ages and early modern period in all European countries. No major revision occurred for nearly 200 years after Elizabeth’s time, but several refinements and redefinitions were added. Edmund Gunter, a 17th-century mathematician, conceived the idea of taking the acre’s breadth (4 perches or 22 yards), calling it a chain, and dividing it into 100 links. In 1701 the corn bushel in dry measure was defined as “any round measure with a plain and even bottom, being 18.5 inches wide throughout and 8 inches deep.” Similarly, in 1707 the wine gallon was defined as a round measure having an even bottom and containing 231 cubic inches; however, the ale gallon was retained at 282 cubic inches. There were also a corn gallon and an older, slightly smaller wine gallon. There were many other attempts made at standardization besides these, but it was not until the 19th century that a major overhaul occurred. 10 imperial pounds weight of distilled water weighed in air against brass weights with the water and the air at a temperature of 62 degrees of Fahrenheit’s thermometer and with the barometer at 30 inches. the straight line or distance between the centres of two gold plugs or pins in the bronze bar…measured when the bar is at the temperature of sixty-two degrees of Fahrenheit’s thermometer, and when it is supported by bronze rollers placed under it in such a manner as best to avoid flexure of the bar. Other units were standardized during this era as well. SeeBritish Imperial System. Finally, by an act of Parliament in 1963, all the English weights and measures were redefined in terms of the metric system, with a national changeover beginning two years later. when the example of its benefits, long and practically enjoyed, shall acquire that ascendancy over the opinions of other nations which gives motion to the springs and direction to the wheels of the power. Instead of adopting metric units, the United States tried to bring its system into closer harmony with the English, from which various deviations had developed; for example, the United States still used “Queen Anne’s gallon” of 231 cubic inches, which the British had discarded in 1824. Construction of standards was undertaken by the Office of Standard Weights and Measures, under the Treasury Department. The standard for the yard was one imported from London some years earlier, which guaranteed a close identity between the American and English yard; but Queen Anne’s gallon was retained. The avoirdupois pound, at 7,000 grains, exactly corresponded with the British, as did the troy pound at 5,760 grains; however, the U.S. bushel, at 2,150.42 cubic inches, again deviated from the British. The U.S. bushel was derived from the “Winchester bushel,” a surviving standard dating to the 15th century, which had been replaced in the British Act of 1824. It might be said that the U.S. gallon and bushel, smaller by about 17 percent and 3 percent, respectively, than the British, remain more truly medieval than their British counterparts. At least the standards were fixed, however. From the mid-19th century, new states, as they were admitted to the union, were presented with sets of standards. Late in the century, pressure grew to enlarge the role of the Office of Standard Weights and Measures, which, by Act of Congress effective July 1, 1901, became the National Bureau of Standards (since 1988 the National Institute of Standards and Technology), part of the Commerce Department. Its functions, as defined by the Act of 1901, included, besides the construction of physical standards and cooperation in establishment of standard practices, such activities as developing methods for testing materials and structures; carrying out research in engineering, physical science, and mathematics; and compilation and publication of general scientific and technical data. One of the first acts of the bureau was to sponsor a national conference on weights and measures to coordinate standards among the states; one of the main functions of the annual conference became the updating of a model state law on weights and measures, which resulted in virtual uniformity in legislation. Apart from this action, however, the U.S. government remained unique among major nations in refraining from exercising control at the national level. One noteworthy exception was the Metric Act of 1866, which permitted use of the metric system in the United States. One of the most significant results of the French Revolutionwas the establishment of the metric system of weights and measures. European scientists had for many years discussed the desirability of a new, rational, and uniform system to replace the national and regional variants that made scientific and commercial communication difficult. The first proposal closely to approximate what eventually became the metric system was made as early as 1670. Gabriel Mouton, the vicar of St. Paul’s Church in Lyon, France, and a noted mathematician and astronomer, suggested a linear measure based on the arc of one minute of longitude, to be subdivided decimally. Mouton’s proposal contained three of the major characteristics of the metric system: decimalization, rational prefixes, and the Earth’s measurement as basis for a definition. Mouton’s proposal was discussed, amended, criticized, and advocated for 120 years before the fall of the Bastille and the creation of the National Assembly made it a political possibility. In April of 1790 one of the foremost members of the assembly, Charles-Maurice de Talleyrand, introduced the subject and launched a debate that resulted in a directive to the French Academy of Sciences to prepare a report. After several months’ study, the academy recommended that the length of the meridian passing through Paris be determined from the North Pole to the Equator, that 1/10,000,000 of this distance be termed the metre and form the basis of a new decimal linear system, and, further, that a new unit of weight should be derived from the weight of a cubic metre of water. A list of prefixes for decimal multiples and submultiples was proposed. The National Assembly endorsed the report and directed that the necessary meridional measurements be taken. The standard metre was the Delambre-Mechain survey-derived “one ten-millionth part of a meridional quadrant of the earth.” The gram, the basic unit of mass, was made equal to the mass of a cubic centimetre of pure water at the temperature of its maximum density (4 °C or 39.2 °F). A platinum cylinder known as the Kilogram of the Archives was declared the standard for 1,000 grams. The litre was defined as the volume equivalent to the volume of a cube, each side of which had a length of 1 decimetre, or 10 centimetres. The are was defined as the measure of area equal to a square10 metres on a side. In practice the multiple hectare, 100 ares, became the principal unit of land measure. The stere was defined as the unit of volume, equal to one cubic metre. Names for multiples and submultiples of all units were made uniform, based on Greek and Latin prefixes. The metric system’s conquest of Europe was facilitated by the military successes of the French Revolution and Napoleon, but it required a long period of time to overcome the inertia of customary systems. Even in France Napoleon found it expedient to issue a decree permitting use of the old medieval system. Nonetheless, in the competition between the two systems existing side by side, the advantages of metrics proved decisive; in 1840 it was established as the legal monopoly in France, and from that point forward its progress throughout the world has been steady, though it is worth observing that in many cases the metric system was adopted during the course of a political upheaval, just as in its original French beginning. Notable examples are Latin America, the Soviet Union, and China. In Japan the adoption of the metric system came about following the peaceful but far-reaching political changes associated with the Meiji Restoration of 1868. In Britain, the Commonwealth nations, and the United States, the progress of the metric system has been discernible. The United States became a signatory to the Metric Convention of 1875 and received copies of the International Prototype Metre and the International Prototype Kilogram in 1890. Three years later the Office of Weights and Measures announced that the prototype metre and kilogram would be regarded as fundamental standards from which the customary units, the yard and the pound, would be derived. Throughout the 20th century, use of the metric system in various segments of commerce and industry increased spontaneously in Britain and the United States; it became almost universally employed in the scientific and medical professions. The automobile, electronics, chemical, and electric power industries have all adopted metrics at least in part, as have such fields as optometry and photography. Legislative proposals to adopt metrics generally have been made in the U.S. Congress and British Parliament. In 1968 the former passed legislation calling for a program of investigation, research, and survey to determine the impact on the United States of increasing worldwide use of the metric system. The program concluded with a report to Congress in July 1971 that stated, “On the basis of the evidence marshalled in the U.S. Metric Study, this report recommends that the United States change to the International Metric System” (D.V. De Simone, A Metric America: A Decision Whose Time Has Come). Parliament went further, establishing a long-range program of changeover. Since 1983 the metre has been defined as the distance traveled by light in a vacuum in 1/299,792,458 second. The standard for the unit of mass, the kilogram, is a cylinder of platinum-iridium alloy kept by the International Bureau of Weights and Measures, located in Sèvres, near Paris. A duplicate in the custody of the National Institute of Standards and Technology serves as the mass standard for the United States. The kilogram is the only base unit still defined by an artifact. However, in 1989 it was discovered that the prototype kept at Sèvres was 50 micrograms lighter than other copies of the standard kilogram. To avoid the problem of having the kilogram defined by an object with a changing mass, the CGPM in 2011 agreed to a proposal to begin to redefine the kilogram not by a physical artifact but by a fundamental physical constant. The constant chosen was Planck’s constant, which was defined to be equal to 6.6260693 × 10−34joule second. One joule is equal to one kilogram times metre squared per second squared. Since the second and the metre were already defined in terms of the frequency of a spectral line of cesium and the speed of light, respectively, the kilogram would then be determined by accurate measurements of Planck’s constant. The second is defined as the duration of 9,192,631,770 cycles of the radiation associated with a specified transition, or change in energy level, of the cesium-133 atom. The ampere is defined as the magnitude of the current that, when flowing through each of two long parallel wires separated by one metre in free space, results in a force between the two wires (due to their magnetic fields) of 2 × 10−7 newton (the newton is a unit of force equal to about 0.2 pound) for each metre of length. However, in 2011 the CGPM agreed to a proposal to begin to redefine the ampere such that the elementary charge was equal to 1.60217653 × 10−19coulomb. The thermodynamic, or Kelvin, scale of temperature used in SI has its origin or zero point at absolute zero and has a fixed point at the triple point of water (the temperature and pressure at which ice, liquid water, and water vapour are in equilibrium), defined as 273.16 kelvins. The Celsius temperature scale is derived from the Kelvin scale. The triple point is defined as 0.01 degree on the Celsius scale, which is approximately 32.02 degrees on the Fahrenheit temperature scale. However, in 2011 the CGPM agreed to a proposal to begin to redefine the kelvin such that Boltzmann’s constantwas equal to 1.3806505 × 10−23 joule per kelvin. The mole is defined as the amount of substance containing the same number of chemical units (atoms, molecules, ions, electrons, or other specified entities or groups of entities) as exactly 12 grams of carbon-12. However, in 2011 the CGPM agreed to a proposal to begin to redefine the mole such that the Avogadro constant was equal to 6.0221415 × 1023 per mole. The candela is defined as the luminous intensity in a given direction of a source that emits monochromatic radiation at a frequency of 540 × 1012 hertz and that has a radiant intensity in the same direction of 1/683 watt per steradian (unit solid angle). A list of the widely used units in the SI system is provided in the table. Prefixes and units used in the metric system are provided in the table. *The metric system of bases and prefixes has been applied to many other units, such as decibel (0.1 bel), kilowatt (1,000 watts), megahertz (1,000,000 hertz), and microhm (one-millionth of an ohm). A list of metric conversions is provided in the table. **Common term not used in SI. Source: National Bureau of Standards Wall Chart. Benard Ssonko (70) taata wa Chris Evans omutto abadde omutuze w'e Kajjansi mu zooni ya Nakigalala y'agudde mu kaabuyonjo y'ewaka we bw'adde agenze okweyamba. Sam Lutwama ng’ono ye ssentebe w’ekitundu kino agamba nti ekireetedde kaabuyonjo eno okuggwayo ye nnamutikwa w’enkuba eyatonnye okumala ennaku bbiri ekyareetedde amazzi okuyingira mu seminti n'anafuwa. Pasco Muyingo mulirwana w’omugenzi Ssonko agamba nti ku ssaawa 4:30 ez'oku makya ng'enkuba ekedde yagenzeeko mu maka g’omugenzi wabula yamusanze munakuwavu kubanga wirubalo ye yabadde ebbiddwa abantu abatannamanyikibwa era olwamaze okumutegeeza ekiriwo n'amugamba k'asooke agendeko mu kaabuyonjo kubanga yabadde teyeewulira bulungi. Muyingo ayongeddeko nti yabadde ku bodaboda ye nga yesigamye yazzeemu okuwulira nga Ssonko alaajana nga bwaasaba okumuyamba kubanga yabadde aguddeyo. Yalagidde omwana n'agenda okusaba abatuze baleete eddaala n’omuguwa basobole okuggya Ssonko mu kaabuyonjo. Ebyembi eddala n’omuguwa byabuze mu kadde ako , baagenze okubifuna nga n'ekiseminti kya kaabuyonjo kyonna kiguddemu ne kimubuutikira bw'atyo n'afiiramu. Nga wayise ebbanga poliisi y'e Kajjansi yazze n'ennyulula omulambo ne gutwalibwa mu ddwaaliro e Mulago gye gwaggyiddwa omugenzi n'aziikibwa n'aziikibwa e Makandwa. Munsi ezikulakulanye, zewaana nyo nti olwenzijanjaba enungi zirina abakadde bangi nyo abakyali abalamu. Nti era zirina nabaana abawere abatono enyo abafa. Uganda terina kusembayo emabega kunsonga eno! Abakadde bwemunagayalira ekirabo Tonda kyakuwadde ekyobulamu okuwangala nosirika busirisi nokola entondo Tonda ekirabo aja kukikujjako amangu ago. Banange abakadde mwenna muveyo mwogere ebibaluma okusinga M7 akaddiyidde mubufuzi ye bwanabogereranga olutatadde. Gwe wuyo obadde okyasobola okusindika wheelbarrow nokola emirimu awaka. Okuwangala obadde omanyi ebya Health and Safety! Obadde okimanyi nti floor ya Latrine eyagala repair. Ate nga olina abaana abasobola okukuyamba kukizibu kino. Bo abavubuka abagala okwesimbawo ku bwa LC bebangi ddala abandikuyambye basobole okufuna obuwagizi bwobukulembeze kubyalo byaffe wano e Buganda. Ekibuga ekikadde enyo ekya Oman nga kitemagana okukamala. Ba tourists bangi nyo ddala bakyeyuniramu okukikyalira. Enyonyi nyingi nyo ddala ezitwala abakozi ne ba tourist okukola nokulaba ensi eno engagga enyo olwa Oil gwetunda munsi zonna. Olukung'aana lwategekeddwa meeya wa Nakawa Ronald Balimwezo e Naggulu. Ffenna tetujja kubeera awo kuddukira Namugongo wetuba tukabira ennaku yaffe ne ya Namwandu wa Nyerere! Governmenti ya Uganda mwe muba mukikomya obutamanya oba obujega bwobutamanya kulabirira bantu ba Uganda wano awaka, ate ne munsi endala nyingi gyebabeera. Gwe governmenti ya Uganda, mwe musinga okufunamu kubakozi nabo ababatwala bemuwa license okutwala abantu mumawanga gebweru! Kubanga mulemeddwa ensi ya Uganda okugiteeka kumutindo omulungi ogwo mukozi okukolera obulungi munsi ya Uganda. Bwekityo nemukizuula nti otyo katubafune mu sente bagende bakolere munsi endala? Mwakakizuula. Dembe lyomuntu okutambula nava munsi ye nakyala munsi endala. Kaba kasinge nakolerayo emirimu singa aba akiriziddwa. Governmenti ya Uganda kigikakatako okuloopa mu UN oba mu ICC ensi zino nga OMAN ezitulugunya abantu abanaku aba Uganda abagenyiwadde munsi za Buwarabu engagga , abalemeddwa okufuna emirimu munsi yabwe. NAMAYINGO- A 12-year-old boy was on Sunday eaten by a crocodile on the shores of Lake Victoria. The deceased, Mr Oscar Owere, was a Primary Six pupil at Lolwe Islands Primary School and a resident of Kisumu-Bukangawa village, Lolwe Islands Sub-county in Namayingo District. The Uganda Wild Life Authority makes lots of money from Wild life tourism but seems to look the other way when the crocodiles in the biggest fresh lake in the world are starving! Thirty-year-old Aisha Namulema has had to bear the burden of raising of her children after the two men who fathered them left. Uncomfortable sensation of helplessness and sheer anxiety are what befall the outer and inner person upon paying a visit to Aisha Namulema’s home at Kijjumbula Village in Rakai District. At 30 years of age, Namulema is a single mother of four; a pair of twins (boy and girl) aged nine, her third and last born boy and girl aged five and three years old, respectively. 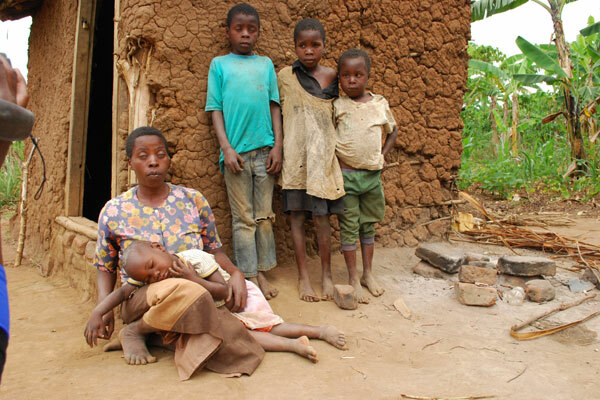 This pitiable family of five stays in a wobbly single-roomed house, molded with mud and eucalyptus poles for support. Namulema says she lost her sight at eight years, when she was studying in Primary One at Kyenvubu Primary School located in Rakai District. She recalls a blurred coating suddenly covering her eyes to destroy her whole sight. She explains that because she was from an impoverished family, she failed to get specialised medical attention for her ailment. This incidentally marked the end of her days in school and the beginning of the untold suffering she is currently undergoing. “My parents tried all they could using herbs and basic medicines, but nothing helped. I instead became shortsighted, and would completely lose my sight when exposed to sunshine,” she narrates. Namulema started her life as a visually impaired child, raised in a polygamous family of nine siblings. At 20 years of age, she met Jordan Ssempijja, a village-mate, with whom she began the journey of parenting. She moved in with her mother-in-law when she got pregnant and bore a pair of twins first and three years later, a baby boy. Her twin daughter and their third born also presented with blurred eye vision when they were just 11 months old and one year old respectively. “My husband superstitiously mistook the poor sight of our children for witchcraft, although he never found any medicines to provide healing,” she says. When her mother-in-law passed on, it marked the end of the little comfort she had found at her husband’s home. Ssempijja abandoned the family under the guise of finding a well-paying job in Kampala. “It is almost five years since he left and he has never returned or sent any support to the family he left behind,” she says. Left with no survival alternative, Namulema returned to her grandmother who gave her the small portion of land on which they live before she died. She supported her family by working as a casual labourer. When she met another man with whom she had her fourth child, he also abandoned her. “I had actually expected him to support us but he did not. I have lost all hope,” she says. Eventually, Namulema completely lost her eyesight and her other three children remain half-blind. They are helpless, surviving at the mercy of well-wishers and passersby. The children and their mother are visibly frail, wear very old clothes, and their feat infected with jiggers and have unshaped fingernails. Inside their falling house, Namulema owns a tinny wooden bed and an old-dusty mattress on which she squeezes herself and her two daughters. “The boys sleep on a bare floor because we cannot fit on this small bed,” she explains. When we meet, I make out from the children’s conversation that they had, for two consecutive days, slept on empty stomachs. These minors are now the primary breadwinners of the family. They fetch water for their neighbours at shs500 per jerry cane, which money they later use to buy maize flour to prepare porridge which is their daily meal. 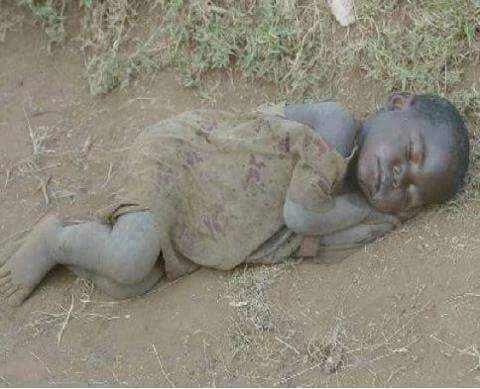 Other essentials such as soap, sugar, tea leaves, toothpaste and the like are luxuries to this starving family. Namulema acknowledges the hardships her young children undergo to fetch water but says she has no other way to survive. “They have learnt to persevere and can now work with less difficulty,” she adds. The local council authorities including the community development officer have not been concerned at all, or even pursued one of her children’s father who is walking freely around the village. Namulema tells me her youngest daughter contracted a fever the previous night and the member of village health team who often checks on them had not showed up yet. Her main concern remains the failure to send her children to school and the lack of food. Adjacent to the house is an inter-cropped plantation of maize, beans and cassava, whose germination rate is however so poor, leaving the family’s future survival under great uncertainty. Achilles Kiwanuka, a village health volunteer and para-social worker deployed by The Aids Support Organisation-TASO, says they are also too constrained to help. “We also don’t have resources to support the family even when we would wish to do so. The remaining alternative is to look for well-wishers who can help them” he suggests. Janet Nakalisa, a professional eye care specialist at Masaka Optical Services says it is not a common occurrence to find family with all members blinds. She, however, explains that it is possible due to risk factors that may range from genetic or nutrition deficiencies to eye-related diseases that include Trachoma. “When people present with eye problems, we conduct a comprehensive study of the patient to establish the cause of the problem, besides analysing their eyesight errors to determine the required glasses,’ she notes, advising the family to seek expert services. Talk of Celebrating or Remembering Women's Day all over this Planet Earth. The United Nation should be coming all the way to the assistance of such families. Our voices should be heard when we insist that the International Criminal Court at the Hague should right now be working with such victims to find solutions to their life problems. These families do not need lots of money to live a decent modern life. An economic criminal court department should be introduced in this court so that human political leadership that is given the responsibility to attend to such human misery in their various countries can be summoned to the international court of law to answer to such a criminal social neglect. THERE IS INDEED A VERY BIG DIFFERENCE IN TERMS OF INCOME FOR THE WOMEN OF THIS WORLD. THAT IS WHY THE LADIES OF THIS WORLD CANNOT UNDERSTAND THEMSLEVES AT ALL. EBYEWUNYO EBIYITIRIVU BWOTUNULIRA EMUNYENYE ZINO KYONGERA OKULAGA AMAGEZI BWEGATAGYA KUKOMA MUNSI YA TONDA.